Symposium "The Synesthesia of Art and Technology." 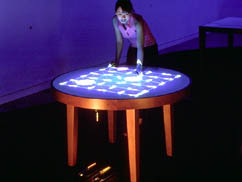 The tops of the four white tables are fitted with a interface for visitors to touch and manipulate with their own hands: switches, dials, and turntables. 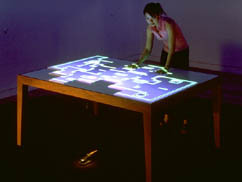 Computer graphics images are projected on the tables' surfaces and the interface from a ceiling-hung projector; as the visitor/participant moves parts of the interface, the projected images responds in real time, as though they were physically linked to the interface. The sounds generated in key with the computer graphics change simultaneously as well. The intimate connection between the interface and the reaction by the computer graphics ensures that the graphics and sound respond just as they ordinarily do when one touches an object; thus, as one experiments with the interface, one gradually comes to see physical reality and the images as being equivalent. The result is, thus, a Mixed Reality environment. The objectives of this were to create a Mixed Reality environment that several participants can share while creating visuals and music together, interactively. The 36 push switches on the round table are fitted into a six by six matrix. Each time the participant presses a switch, the arrow projects on it changes direction. Furthermore, the four lights moving across the table top change direction according to the switch combination pressed, and the interaction creates pulse-like music. This square table is fitted with a circle of 16 dials that can be twisted at will. 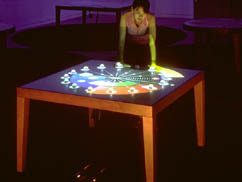 At each turn of a dial, an image projected on the table top changes its angle, and the music created in conjunction with it also changes. The round table top is covered with four white platters that rotate freely-like a set of DJ's turntables. 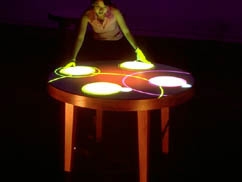 When the participant turns one of the platters, the computer graphics and music go through variations in response to the changes in speed of rotation and direction. The rectangular table is covered with eight white plates that can slide forward and backward. 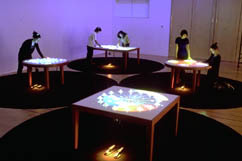 When the participant slides one of them, the combinations of images projected on it alter, and the action of the light playing in circles above it and the music change. Note: This work was created with the cooperation of the Mixed Reality Systems Laboratory Inc. for entry in the First International Symposium on Mixed Reality in 1999 (ISMR99).